According to the U.S. Department of Energy, the nation’s higher education institutions spend $14 billion annually on energy consumption—an expense that continues to rise while their budgets shrink. Universities are expected to be at the forefront of energy sustainability, and the pressure has only intensified as new regulations require schools to improve efficiency. All these challenges are prompting facilities managers to seek innovative solutions. According to a recent survey commissioned by Schneider Electric, more than half (56 percent) of respondents projected they would invest more in energy efficiency next year. With the right energy management strategies, universities could reduce their energy bills by 15 to 30 percent or more. Yet, how can a facilities manager or leadership team find the money needed for improvements and know which investments deliver the best ROI? The answer can be found in building data analytics that uncover hidden savings and reveal where to invest for the highest impact. An intelligent building infrastructure ties together formerly disparate systems, such as power, building management, security and IT. Building management systems (BMS) provide valuable insight into building performance, status of critical infrastructure and the likelihood of impact on building occupants. With graphical user interfaces and mobile applications, this data can be delivered in real time and be at the fingertips of facility managers and executives. But real savings occur when building data is analyzed and turned into action. These analytics are likely to result in significant ongoing energy and cost savings, freeing up funds to help offset improvements. Determining which improvements to make and setting priorities can be daunting. Again, data analytics can guide the plan of action. Customized reports prioritize areas of improvement according to projected payback and required up-front costs. These reports help facilities managers allocate precious dollars wisely to those projects that can deliver maximum impact and measureable ROI, including enhanced building performance, reduced operating costs and optimized energy efficiency. Building analytics can identify hidden cost savings and guide energy investments. Learn more about how universities can benefit from building analytics by checking out the Green Building News article Using Data Analytics to Improve Building Resources. 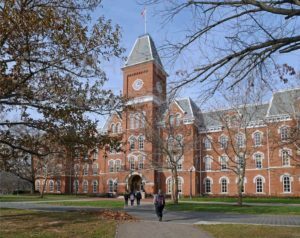 What’s the biggest challenge to universities as they seek to conserve energy and contain costs? Join the conversation in the comments below. The idea of analyzing energy data for buildings to generate ROI for projects makes sense. It’s necessary but probably not sufficient. In a University context, there’s a school administration and an Board of Directors of some sort (whether a public or private institution). For steadily improving energy performance, direct support and visible leadership by the President and senior administrators is key. If that IS in place, what project priorities for the buildings might we expect? 1) Seal and insulate the building. This will produce savings all year and in all climate zones. Focus on buildings that will be around a while. 2) Replace appliances with more efficient designs, either when the old one wears out, or when the payout justifies. This includes turning appliances off when not in use. 3) Install photovoltaic panels where it is feasible and economically justified. Don’t, however, use PV to hide excessive electrical usage. Make sure energy efficiency/conservation has first been considered. 4) Manage radiant solar energy seasonally. This includes roof heating but is mainly focused on sunlight penetrating the windows. 5) Other economically justified efficiency and conservation projects such as heat exchange, process tuning, or process control software. Also, make sure the “sustainability plan” has a prominent energy component as well as recycling. wd, thank you for your interest in this blog and for your comment. You are correct that having direct support and visible leadership by the President and senior administrators is key to success. It can be difficult to obtain continuous budget approval for these type of projects. Utilizing building data analytics can be a great way to elevate the need for improving energy performance and gain support for specific projects. Plus, when utilizing systems many colleges and universities already have invested in (metering and building management systems to name a few) with analytics you move beyond just energy efficiency but also realize operational efficiencies. Sealing and insulating buildings are great starting points but gaining visibility across an entire campus through building data and having the ability to measure, analyze, and manage energy on a continuous basis allows institutions to improve inefficiencies and bring balance to the overall budget. I appreciate the conversation and look forward to hearing from you more on future posts.